Recently I’ve been shooting film rather than digital, its learning curve and its more expensive but it’s great fun and it’s been helping me to develop as a photographer, plus I like a challenge and the opportunity to learn new skills. With the advent of digital photography, you can now pick up high quality film cameras for decent money. These older film cameras come with bags of character and style. I got hold of a great condition Mamiya RB67 pro, a completely manual camera and capable of producing stunning images for around £200. Film for these cameras is still available and there are plenty of places to get it developed and printed. If anything the popularity of film cameras is increasing much in the same way as records are becoming more popular due to their tactile nature. In an ideal world I would be processing and developing my own film in a dark room, but for the time being I have to make do with sending the negatives away for processing before I scan them. I wanted to get the most out of my medium format negatives and try to do them some justice. I already had an Epson V500, capable of producing reasonable quality scans and certainly good enough for the internet, but I felt I need something better. 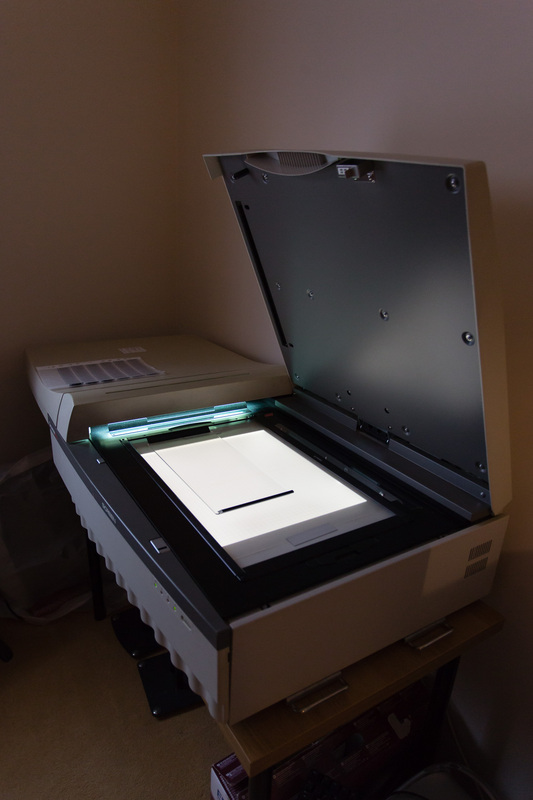 High quality flatbed scanners such as the Epson V850 are available but they will set you back around £600. Reading around the internet I came across the Screen Cézanne Elite. 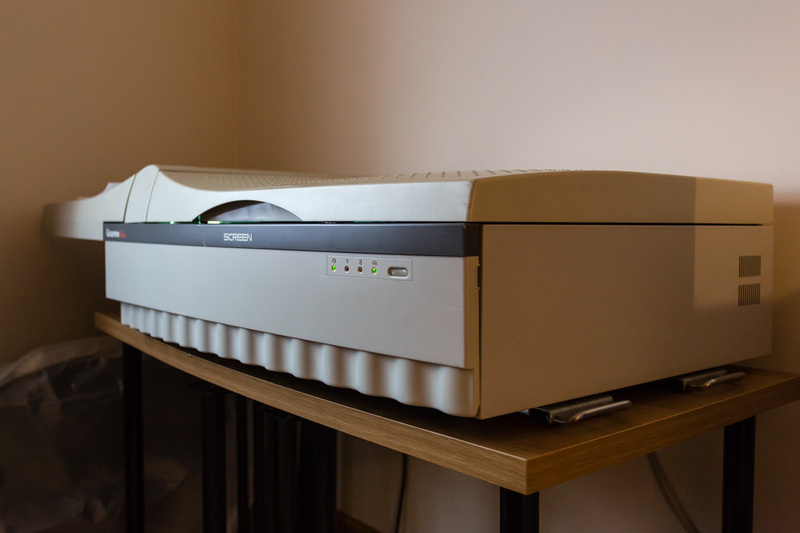 It’s an older scanner used primarily in the pre-press stage of print production. A number of large format photographers were using them to great effect and in some situations they produce results as good as a drum scan. I was lucky to find one on EBay, it wasn’t getting much interest and after contacting the seller I did a deal to collect for £150, there is no way you are going to post something like this, he also chucked in a computer that didn’t work and he couldn’t find the SCSI cable. I managed to get a replacement computer for £40 and a cable set me back about £25. So all in I got a high spec scanner for £215, a lot cheaper than a top of the range Epson but certainly not as easy to use. The Screen Cezanne Elite is a monster of a scanner weighing in at a back-breaking 73kg. It has a 3 line CCD array with 8000 elements in each line and can scan up to 5300dpi without interpolation, although this reduces depending on the size of the scan area. The scanning bed will accept anything up to a maximum size of 329mm x 530mm (A3+) making it ideal for large size negatives, transparencies or reflective materials. These scanners aren’t new and parts are expensive, to help me get the most out of the scanner I’ve removed the bottom fluorescent tubes to keep as spares. This prevents me scanning reflective material, but it’s no hassle to put them back in should I need to. The layout of the scanner is slightly different to normal flatbeds. 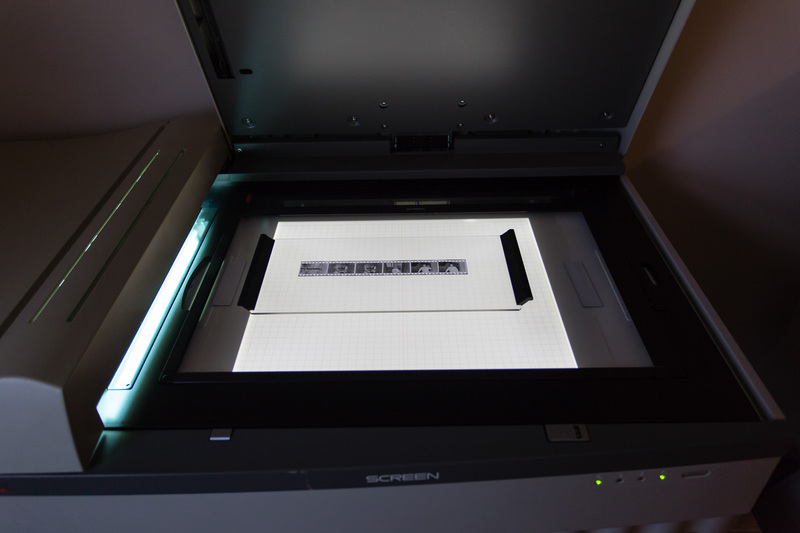 With the Cezanne the bed moves across a fixed light source, the large projection out of the side of the scanner protects the scanning bed when extended. A camera housed within the scanner is able to move anywhere along an X/Y axis. The great thing about this layout is that you place the negatives flat down on a sheet of anti-newton ring (ANR) acrylic. 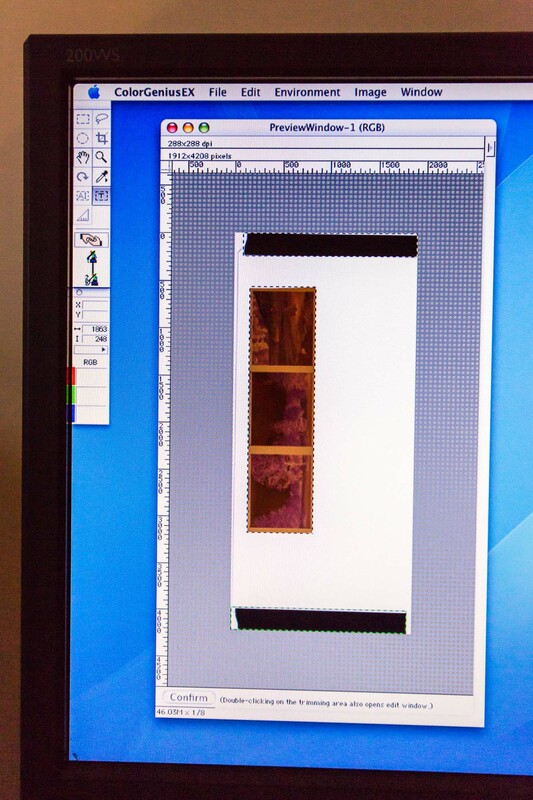 You then place another piece of ANR acrylic over the top of the negative, this keeps it flat and in focus. The one downside to using ANR acrylic is that it’s easily scratched. Removing scratches in Photoshop is easy but tedious, at some point in the future I will switch the beds to ANR glass which is much more scratch resistant. With this setup I’m able to place several negative strips down on the bed and queue up the scans saving a lot of hassle and time. In order to make the scanning process more efficient I’ve changed a few things. I installed a USB 2.0 PCI card in the G4 massively improving the file transfer speed over the original USB 1.1 that the G4 comes fitted with. I made sure the G4 was running the maximum amount of RAM, in this case 1.5GB. 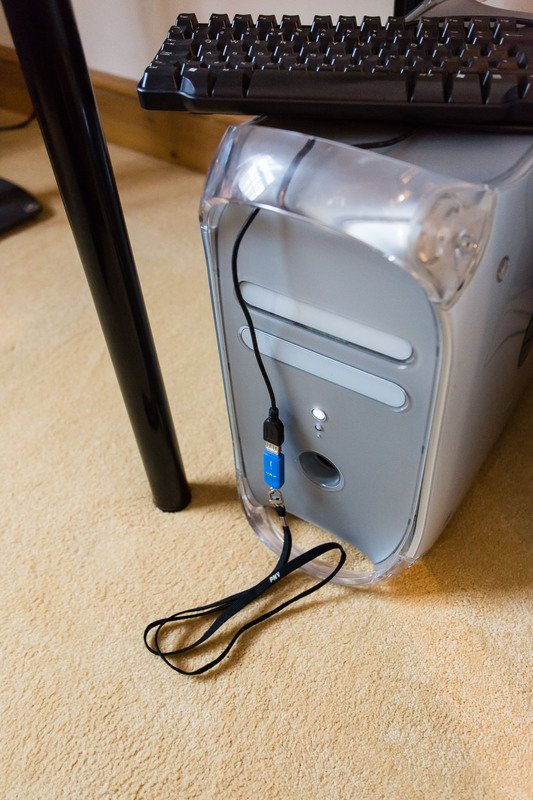 I’ve used a USB extension cable connected to the rear of the G4 so that I can quickly connect a pen drive. The hard drives in these machines are quite small and it would be very easy to fill. Using a pen drive allows me to easily transfer the scan files across to another more modern computer. 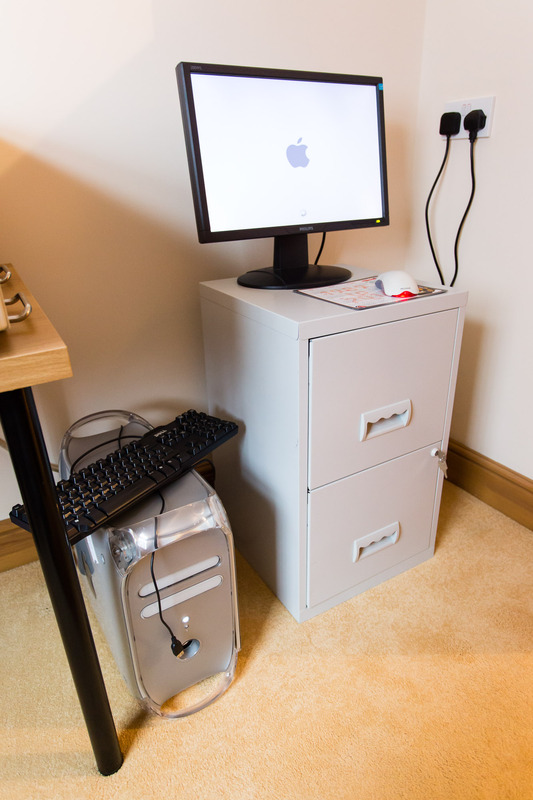 Top tip – When using a SCSI connected device make sure that the device is powered up before you turn on the computer otherwise the computer might not see it. If you’re going to pick up one of these scanners you need to make sure that comes with the correct software and has a working serial number. Without those you have a very heavy and large doorstop as it won’t work with third-party scanning software. Apparently you can still buy the software but you’re going to be looking at £1000. My scanner came with version 2.1.1 of ColorGenius which I’ve updated to version 2.13, there is a later version but that’s for OS X 10.6 onwards. The latest drivers and updates are available from here although the software is no longer being developed. 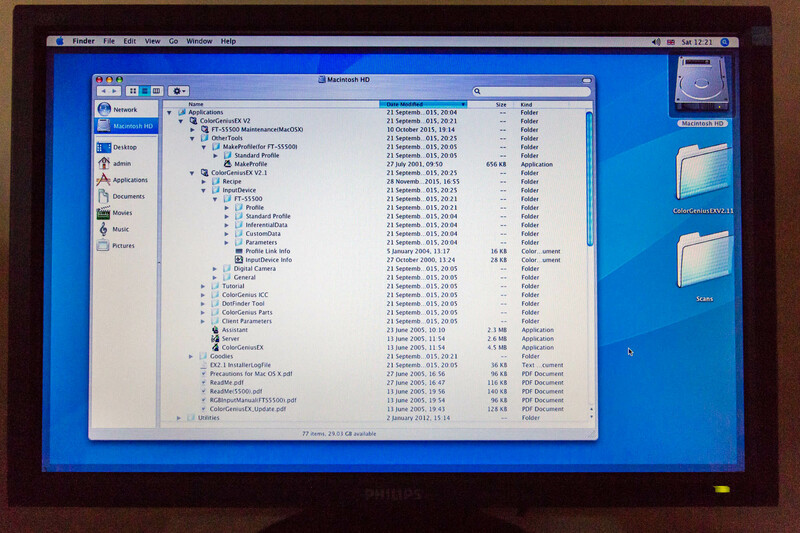 My G4 is currently running happily on OS X 10.4.11. 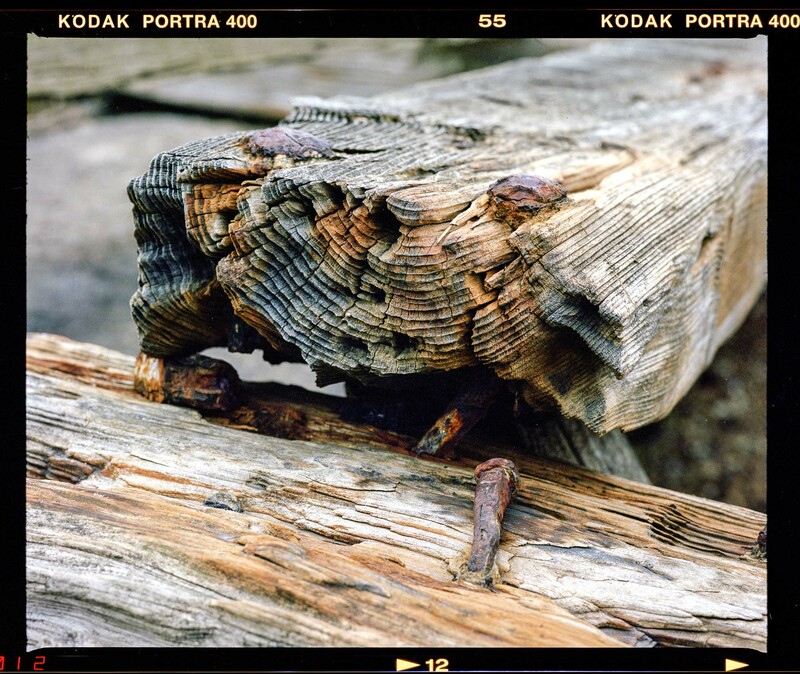 If it hadn’t been for people taking the time to document and discuss what they were doing with negative scanning I wouldn’t have known about the Screen Cézanne or how to use it. Therefore I feel it’s only fair that I contribute my experiences to that pool of knowledge, so that anyone else picking up one of these scanners will have some basic information to get started. 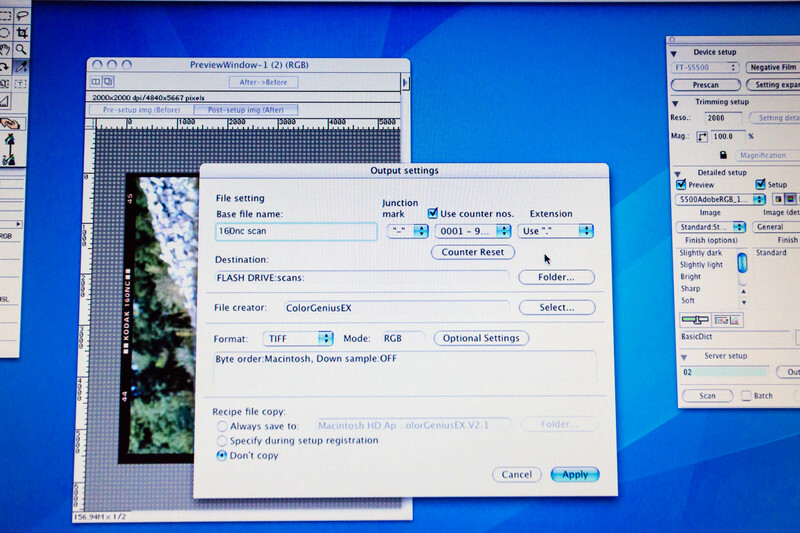 This is the process I use for negative scanning with the Screen Cezanne Elite and ColorGeniusEX software. Scanning is a dark art and it can get horrendously complicated, I prefer to keep it as simple as possible. My aim is to keep the scan as untouched as possible, any follow-up work can be done in Photoshop afterwards. 2, This is the device set up screen. 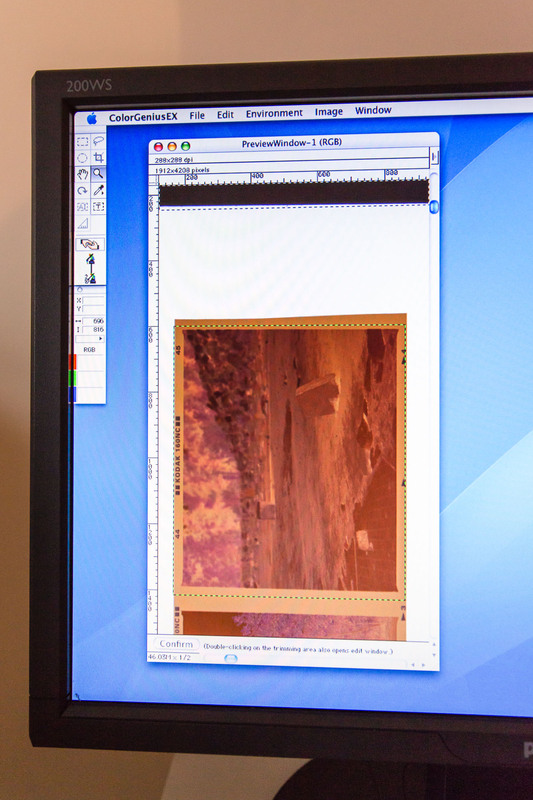 As you can see from the image I’ve set it to Negative Film and the scan resolution is 2000dpi. 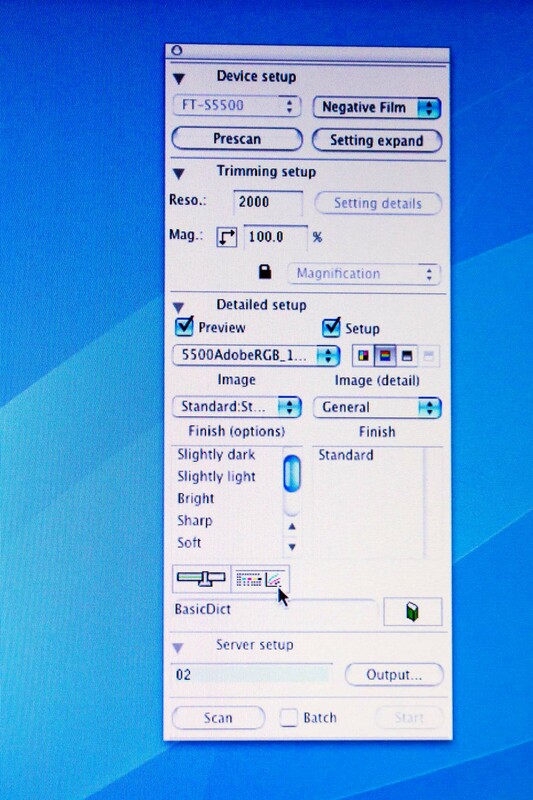 If your happy with the settings you need to hit prescan. 3, The scanner is now scanning the entire bed to see what’s on there. It takes a little time so just relax. 4, This is the preview you get from the prescan. In this case it’s picked up the negative and the handles from the hold down plate and automatically selected them, indicated by the dashed line. That’s not a problem though as you can manually adjust the scanning areas. 5, With the T setting selected in the control panel on the left you can adjust area you want to scan. Here I’ve zoomed in to get a better view of where I want my scan edges to be. 6, By double clicking on the scan area I get a preview of the image. 7, Now going back to the device setup window I can opt to adjust some of the settings prior to the full scan. Clicking on the box with what looks like a graph and some wiggly colour lines will open a second settings box. 8, This is the manual colour adjustment box. Personally I like to keep things as simple as possible. 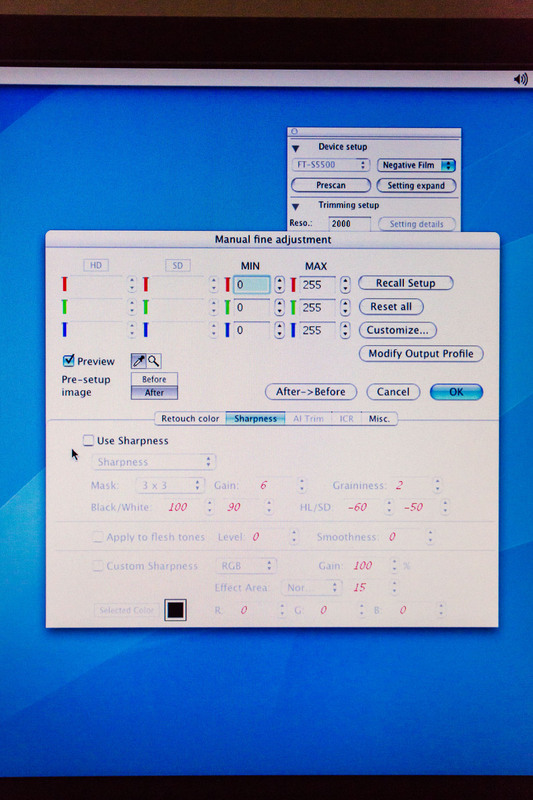 Under the Retouch Color tab I make sure that Color Correction isn’t selected. 9, Under the Sharpness tab I uncheck the Use Sharpness box. 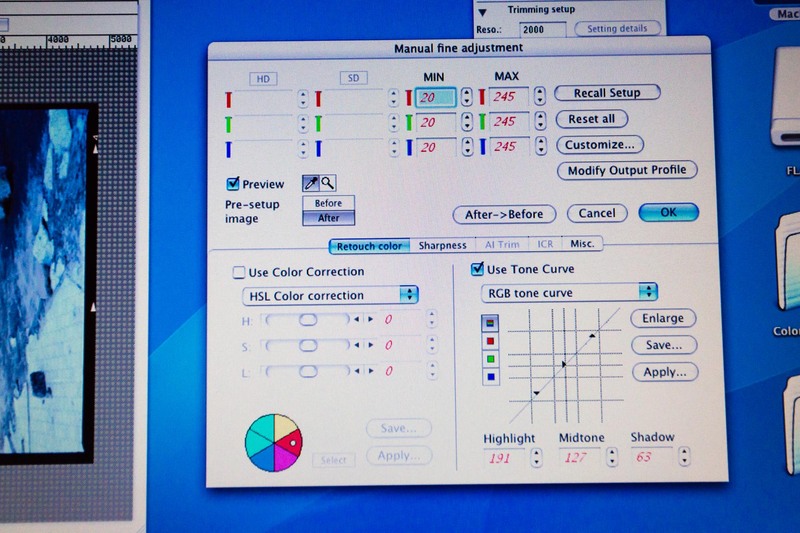 10, I then adjust the colour range settings from its default 20 – 245 to 0-255. I do this for each of the colour channels. When that’s all done hit Ok.
11, Now you need to hit the Output button on the Device Setup panel. Here you can set your scan filename and the location for where you want the scan to be stored. In this case I am saving the scan as an RGB TIFF image to a memory stick. 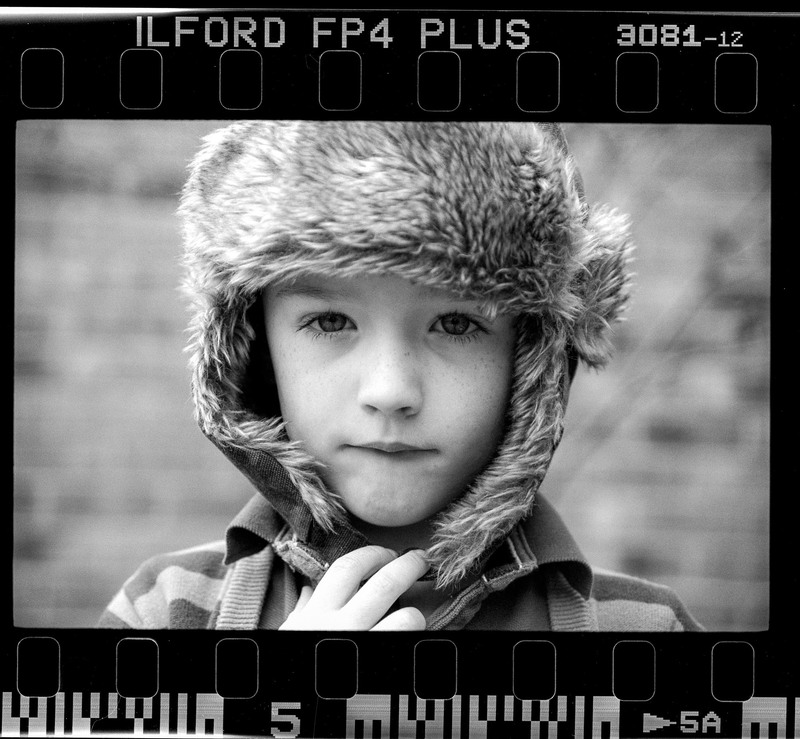 This is a 4000dpi scan of a 35mm Black and White negative. I removed scratches in Photoshop and resized to 2000px <500kb for the web page. Actually it does do just that. Outresolves the drum scanners I’ve owned too. If anyone is interested, I have a Screen Cezanne Elite FT-5500 available for sale. I also have the Power MAC G4 that was used with it and the SCSI card (no cable). I am in the USA, California. No reasonable offer refused! What do you call a reasonable offer. I will have add shipping costs to it. I would like it for a bit of fun. I did work for Dainippon Screen some time ago. Hello : i’m french : in France ! i want buy your Scanner / ” Cezanne Elite FT-5500 / and the Power Mac G4 qui a été utilisé the carte SCSI (not câble). Yes, consumer flatbeds often have wildly optimistic resolution claims, but this isn’t a consumer flatbed. When new it cost as much as a nice new car. The Seybold Report tested a bunch of pro scanners, and the two Screen Cezannes hit the limits of their testing ability. I have an FS-5000 myself, and I’ve checked it with a high resolution chrome on glass resolution target from Edmund Optics. Very close to 6000 spi is achievable with a Cezanne. Peter beat me to it. These scanners are very capable pieces of equipment. One of the reasons I decided to go for a hulking old machine with a dedicated computer over a more modern equivalent is that it has the ability to actually achieve un-interpolated high resolution scans. It weighs 75kg for a reason. 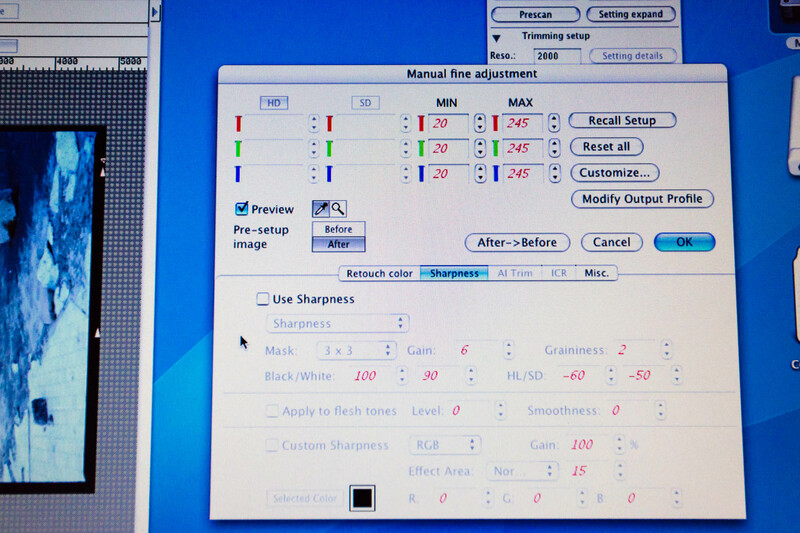 I have tested the Cezanne Elite Pro against Heidelberg, ICG, Howtek and Screen drum scanners and it outresolved them all. It does have problems with recovering deep shadows for transparency (hardware saturation boost to blame) but you won’t get more detailed and clean 35mm and 645 negative scanner anywhere. It’s a shame about the problems caused by dust – you need a really clean machine to avoid streaking when recovering highlights on net scans though. Dust, the remorseless enemy of the scanner. I do still have this Screen Cezanne FT-S5500 Scanner available for sale. It is in like new condition and I have an Apple Power Mac G4 system to go along with it. Please let me know if anyone is interested. I am located in California USA. Hi Gareth, yes I’m still scanning. I scan black and white negatives as colour. This is because the Cezanne will only do 8bit for B&W where as scanning as colour is 16bit. Of course I’m going off what other Cezanne users have told me and I should probably check to be sure. 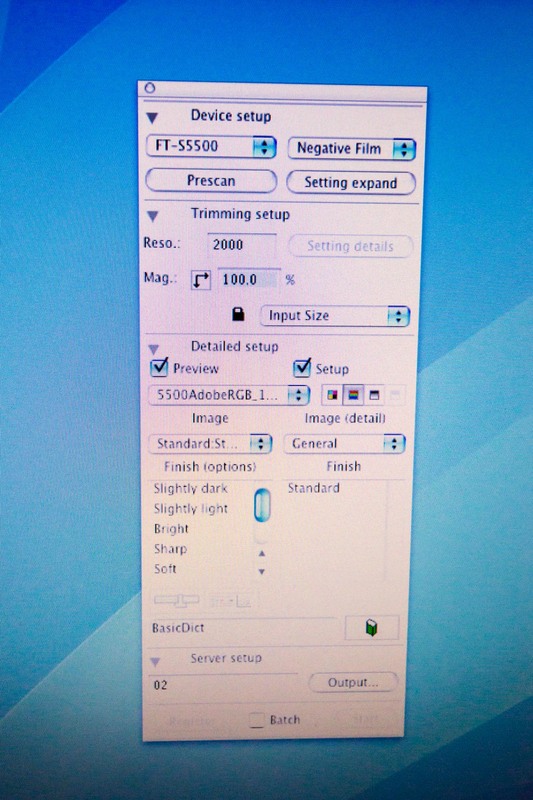 When I have my scan, I open it in Photoshop and drop two of the channels, usually red and blue. I then change the mode to grayscale and save it. Really useful, thanks! I’m looking at getting one of these beasts, what sort of scan times would I be looking at? 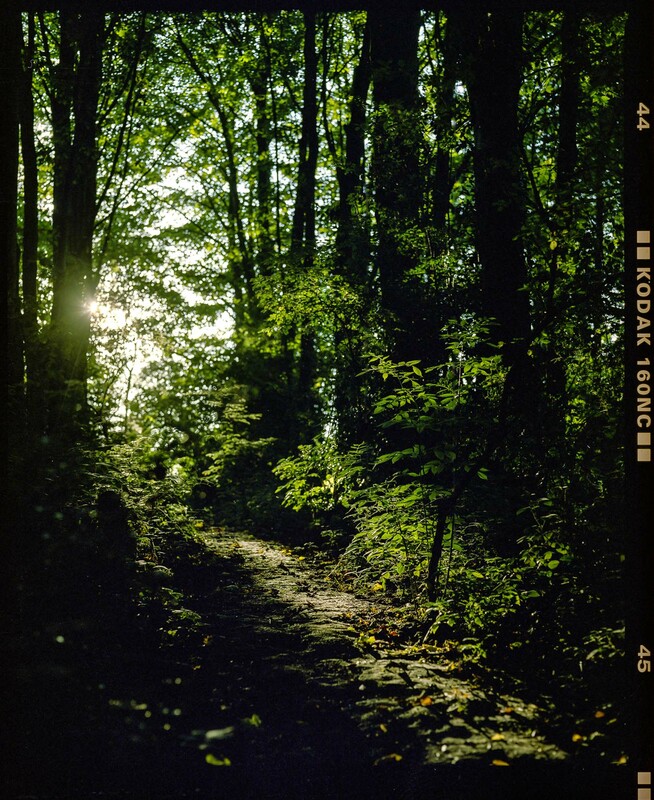 Have you done much 4×5 film? Thanks. There are two versions, the later Elite version is quicker, by how much I’m not sure. 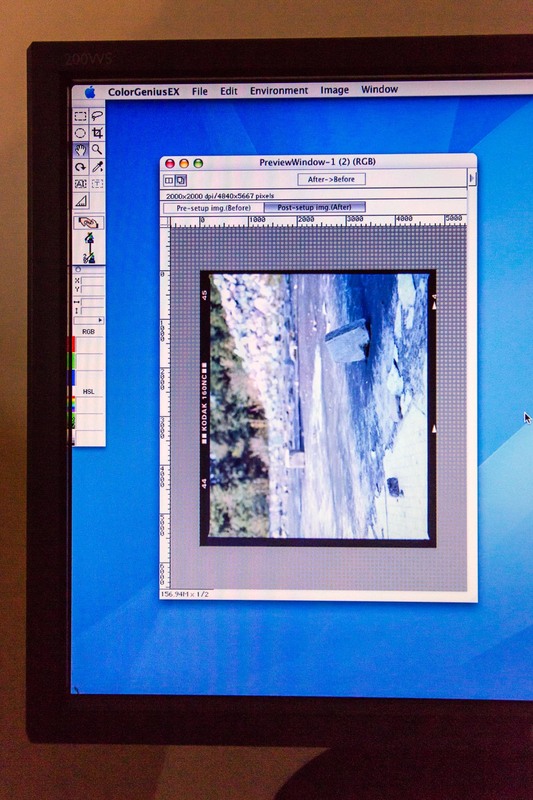 A 120 image at 4000dpi takes about 5 minutes if that. 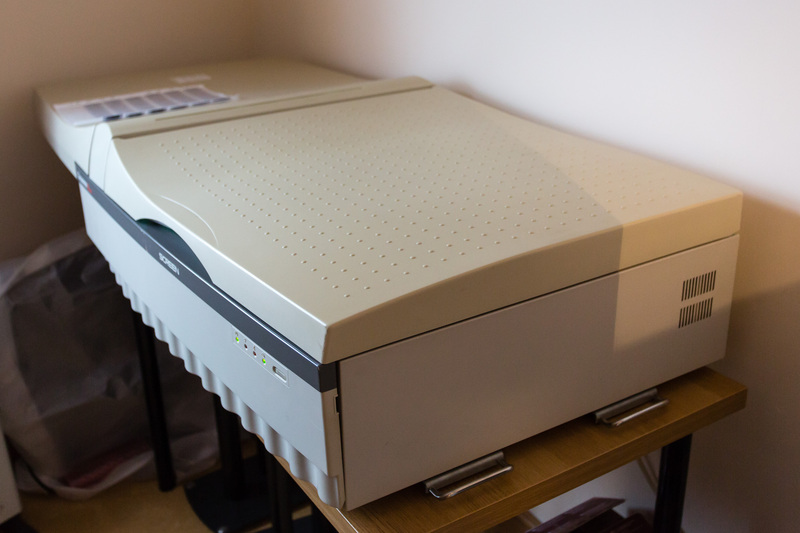 The benefit with this scanner is that you can drop a multiple negatives on the bed, queue them up and wander off.